We left New Orleans around 9:30 after performing the daily bike safety checks. For lunch, we stopped at Lake Charles in Louisiana at a cozy restaurant – Steamboat Bill’s on the Lake. We ordered the Captain Platter, which had shrimp, oysters, and fish. We enjoyed the food, and especially the cold drinks as the weather was in the 90s F (+30 C). We stopped for gas one more time and arrived to Houston at 5:45pm. We covered good distance today. We checked in the hotel and ate at a local Japanese restaurant. The food was ok. Gintaras and I enjoyed the water the most as it was the best thing on their menu. Plus it was cold. After dinner, Gintaras worked on the photos / videos for the website and I worked on attaching the video camera mount on Gintaras’ helmet. I decided to glue the mount on the helmet as the mount would most likely fall off otherwise as a result of high winds while riding and rain. It is best to play it safe. It takes 24 hours for special glue to dry so Gintaras will not be able to use the helmet camera tomorrow until the glue dries completely and “integrates” with the helmet. Our objective is to finish all the final preparations for our long journey abroad before crossing the border into Mexico. 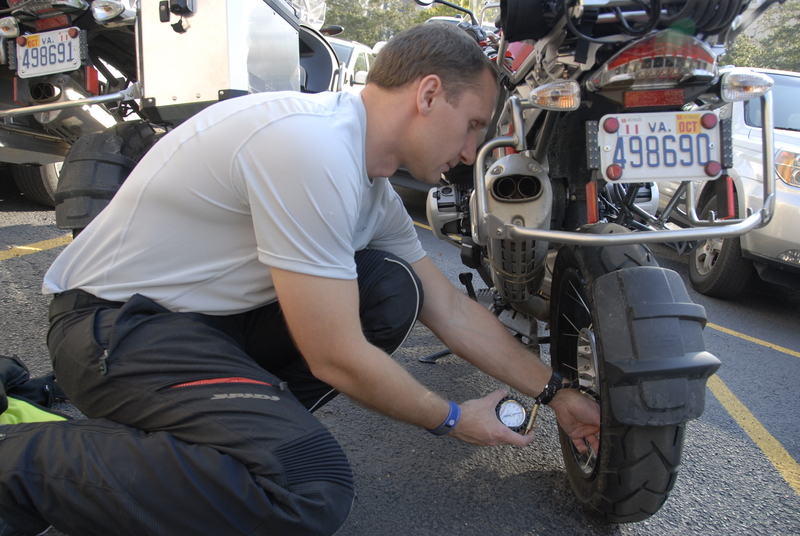 Vadim performing the daily exercise – tire pressure check.